Scarlet was a short-timer, a quilt top nabbed for a song, given a few quick repairs, and finished up. I make no secret that I keep an eye on the auctions for used quilt tops; mostly I look to see what's out there, and very very rarely I'm moved to pick one up. She -- and this quilt top was a 'she' from the start -- just delighted me from the start. 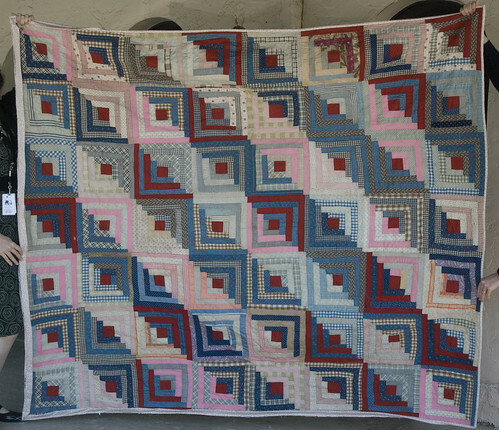 It was lovely, imperfect, and utterly without pretense; it was a hand-sewn quilt top in the log cabin variation known as "straight furrows." 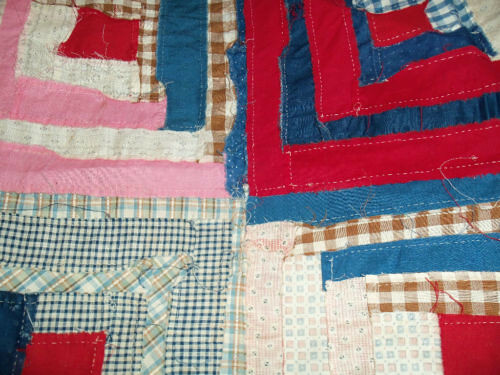 Vintage Log Cabin Quilt Top. Not sure of age. From an Estate of lady who was over 100 yrs. old. About 70-74" wide and 80-84" long. All hand pieced, slight musty odor from storage. A few minor stains, showed a couple in last two pictures. They are not very noticeable. Great old colors, blues, browns, reds, peach, pink, black, gray and others. Cost? $35 before shipping, $43 after. When I opened up the box, I was delighted by what I saw. The squares weren't perfectly square, but the end result was pleasing and the overall appearance was spot-on. My reaction was that it was exactly what I hoped it would be: the kind of simple, clean, charming quilt that will wear well, serve as an instant faux heirloom, and see love and use. 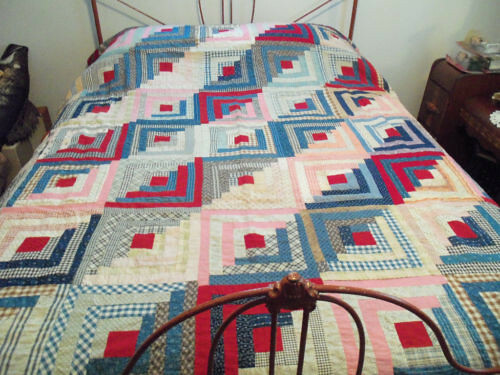 I wrote the seller and confirmed a little more information; she bought the quilt top at an estate sale in Terre Haute, Illinois -- very near Burlington, Iowa. Since several of the prints were 1930s-era, I picked up a 1930s repro fabric of little red dots on a white background, ran a simple quilting pattern of sketched flowers in lines following each of the furrows -- white thread on the lighter sections and red on the darker sections -- and sent Scarlet on her way. 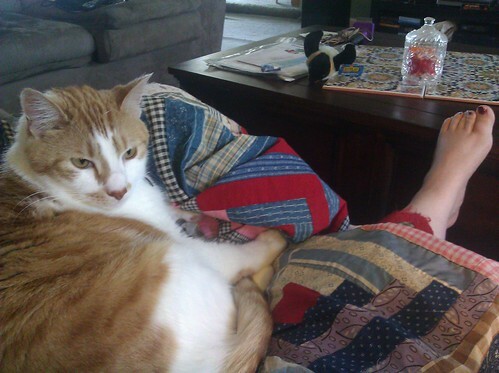 I wish there was more to say, here, but the truth is that Tenzing barely even had time to sit on the quilt before it left the house.